What would you do for a royal romance? Lady Alexandra Monroe has been told in no uncertain terms that she must set her sights on a proposal from Prince Randolph to better her family’s situation. Instead, she finds herself falling for his charming but dangerous younger brother Nicholas, a man whose passionate nature—and irresistible good looks—makes it impossible to remember her duty. But while she is torn between ambition and desire, a wicked scandal brews, shocking secrets are revealed, and soon she begins to wonder: can true love really conquer all? "Nothing gets me to a checkout counter in a local bookstore than one of Julianne MacLean's novels. I know that I cannot go wrong with anything written by her. BE MY PRINCE surpasses my expectations. It is a phenomenal read; one that I just could not put down. I am not normally much for romance novels that focus on royalty, but I will admit that BE MY PRINCE sheds a whole new light on the plotline for me. All I can say is bring me more. 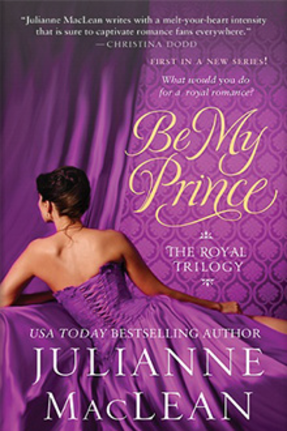 I will be waiting patiently for the next book in THE ROYAL TRILOGY series."